Weather Network Canada | How does YOUR Forecast Look? What is the Weather Network Canada? TWN (as we know it) has always been one of this country's favourite cable television stations. We enjoy the only dedicated full-time weather channel Canada has in English. The company, Pelmorex Inc., operates a very good website as well. Click on this logo on the upper-right to see it. Overall, it’s similar to weather web sites serving other countries. The homepage starts with a national map, with quick passages to provinces and major cities for their Canada network weather information. 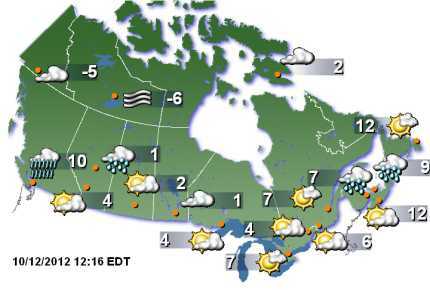 Here, you can see TWN's own forecasts for the major centres in Canada. Below the map, you’ll find the latest weather-related news items, weather photos and scheduling information for the TV station, information on their television forecasters and videos. At the bottom of the home page, you can get weather for your mobile device and RSS feeds. This is geek-speak for Rich Site Summary, a form of data distribution. All good stuff for that weather junkie in your household. Here is a screenshot of the national map on the TWN homepage at a particular point in time. At the top of the page, above this map, you can find Environment Canada weather warnings and watches, if any are in effect, with the location specified. Look even higher on the page to find links for travel maps, severe weather and a wide variety of other related information. Once you’ve picked a community, wait for the page and all its details and advertising to download and display. You’ll see the most recent weather conditions noted first. After that, a short term Weather Network Canadian forcast for approximately the next two days appears and then the long term weather forecast, which is usually six days. In most cases, you can view pictures from city cameras and upload your own if you wish to share. The short term forecast includes a prediction of the amount of precipitation expected over the next 24-hours. Under each short term weather forecast lies a series of special buttons within small blue boxes labeled: Hourly, 14 Day Trend, Weather Maps, Local Traffic Cameras and Highway Forecast. From the 14-day trend, for instance, you get a graph comparing each day's predicted maximum temperature referenced to a horizontal line plotting the normal temperatures for this time of year. Very handy indeed. Canadians rely on road-conditions information and this page is where you will find them. Click on the Highway Forecast link below the 24-hour precipitation forecast. This highway forecast page provides an interactive map along with blue-button links for national highway details, traffic cameras, and additional weather maps for satellite and radar. Find Weather Network Canada information. How to use TWN website and get the info you need.